Home > Home Decor > Canopies & Nets > COMING SOON! Custom Canopy with Silver & Crystal-Choose Canopy Color! COMING SOON! Custom Canopy with Silver & Crystal-Choose Canopy Color! The ShopWildThings Mosquito Net Canopy with Silver Metallic "Spangles" and Beautiful High Quality Acrylic Crystal Beads is made to order using your choice of netting. The Awesome PVC beads that we add to the canopy are a flexible, shiny die-cut material with vibrant color. The acrylic beads are faceted and catch the light beautifully. Mosquito Net Bed Canopies should not be the question. Yes, you need to have one! It's just a matter of which one to choose and where to hang it up! This canopy will fit from a Twin up to a King size bed and look amazing. We also love a canopy over a cake table, or perhaps hanging adorably behind a candy buffet...the possibilities are really endless. The thing is, they fill up a ton of space, add visual interest in an otherwise "blank" ceiling space, and just generally make people happy. Add a pop of color to your space for a tiny investment that doesn't require paint! 100% Polyester Netting - top metal ring 2' Diameter, x 8.2' Long x 39.4' Fabric Circumference. Mounting hardware included. 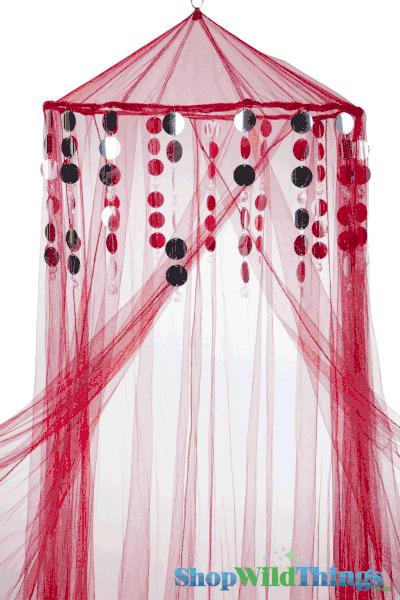 Add the matching 3 Foot Wide Beaded Curtain to really tie the room together. 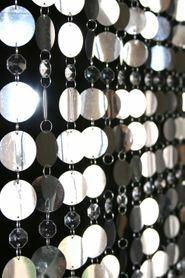 For wide spaces, you can purchase two or more beaded curtains and hang them next to each other. They will look like one continuous curtain! Our beaded curtains come on their own rod. You just need to lift it from the box, hang it on two small nails or hooks, and you're done. They look wonderful in the window and in a doorway. If you'd like to hang strands on your own fabric curtains, you can just remove the strands from the rods and do that too!